Randy Radau’s philosophy has been to make one or two environmental improvements at his place every year. 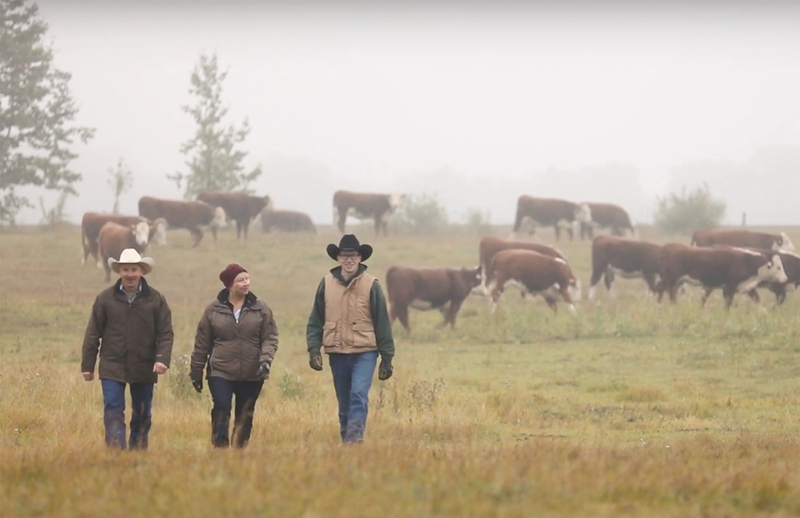 This approach has proved fruitful for the rancher and grain grower, who runs a mixed farm with wife Sandra and son Luke, the recipients of the 2019 Alberta Beef Producers Environmental Stewardship Award. “We haven’t done anything really fancy,” said Radau, who farms east of Bowden on land settled by his grandfather. “We just had a common-sense, down-to-earth approach where we did one or two improvements every year. The family was nominated by Ducks Unlimited and given a recommendation letter from Red Deer County. Coulee Crest Farm covers 3,500 acres, with about 1,500 seeded to crops each year (wheat, canola and barley) and 1,500 acres used for hay and native and tame pasture. 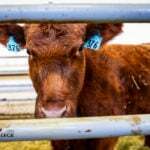 They run about 360 cows (they sell purebred bulls and breeding heifers from their 200-head Hereford herd and also have about 160 commercial Here­ford and Red Baldy-cross cows). Randy Radau began installing solar panels 25 years ago and has about 15 different solar units for things such as waterers and electric fencing. 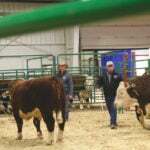 “We’ve had Herefords in our family since 1944. I’m the third generation, and our son, Luke, who is coming back to the farm after university will be the fourth,” said Radau, who also has two daughters who live off farm. The family mainly runs cattle on their own pastures, but uses a small amount of land in the Spruce Coulee, an environmentally significant area. That’s one in a long list of environmental practices adopted by the family. The Radaus calve later and background their weaned calves in corrals from November to February or March. The manure is hauled to different fields every year and turned three or four times, so it has a soil-like appearance by the time it’s spread. They also soil test and monitor nutrients, and have noticed improved yields on the crops from the manure. A Ducks Unlimited project on the farm restored the water level by a foot or two on a 30-acre slough. This improved the habitat for ducks and waterfowl, but also water quality for the cows. 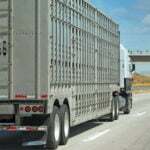 “The environment is our lifeblood in our agricultural operation. If you don’t take care of it, your operation will fail,” Randy Radau says in an Alberta Beef Producers’ video. The family has also completed a winter watering project. 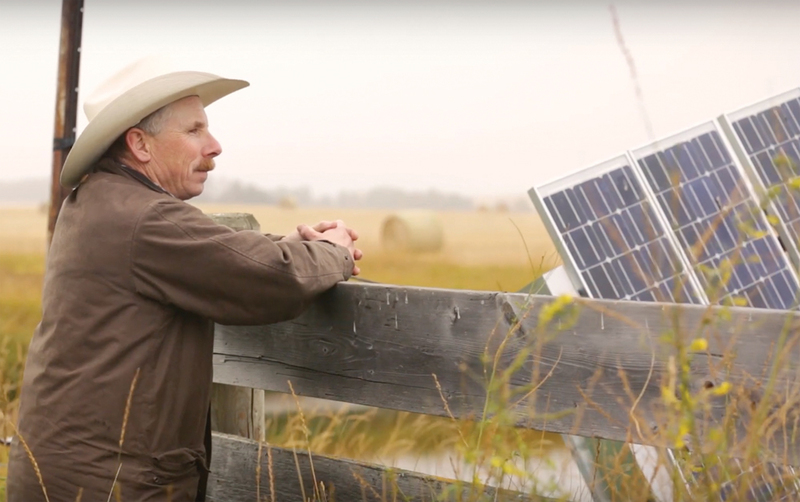 “Instead of chopping ice at a dugout that was in a spring run-off area, we put in a solar pumping site on the edge of the dugout, pumped the water out of the dugout into the water bowl that is made so it won’t freeze because the water goes back down when there are no cows around,” he said. There’s a five-acre spot set aside for wildlife habitat but also serves as a wind shelter for cows when calving. Most of their pastures have been cross-fenced for rotational grazing. “I counted it up and we’re at about 50 different fields that we use for rotational grazing,” said Radau. The family has also converted old windmills to solar, part of an interest in solar that dates back 25 years. “We did our environmental farm plan early, and got ideas from doing that,” he said. “We followed Growing Forward 2 and did other things it helped to fund, like converting our fuel tanks to double-walled fuel tanks. Being recognized for environmental stewardship is an honour, he said, adding he hopes Coulee Crest Farm offers some ideas for others. “We’re just happy that we’re getting recognized and that we can demonstrate to others that cattle can live in harmony with nature and the two can really coexist and benefit each other,” he said. An ABP video on the operation can be found at www.youtube.com (search for ‘Coulee Crest’).